Wall Street has shunned these two stocks, and both face challenges, but there are catalysts that could fuel a rebound for each -- and the dividends aren't too shabby either. Many times when stocks have fallen out of favor with Wall Street, they're cheap for a good reason. However, on occasion, stocks that have fallen out of favor have a chance to rebound and reward investors who were willing to go against the grain. Ford Motor Company (NYSE:F) and Hanesbrands (NYSE:HBI) are two hated dividend stocks right now, and both have rebound potential. Investors were quick to panic after Hanesbrands' second-quarter conference call. That's when management dropped the bombshell that Target doesn't plan to renew a contract for C9 by Champion gear when it ends in January 2020. C9 was a line of gear produced exclusively for Target, and the contract had been in place for more than a decade. That news sent Hanesbrands stock tumbling 18% after the announcement. But how important is Target's decision, really? 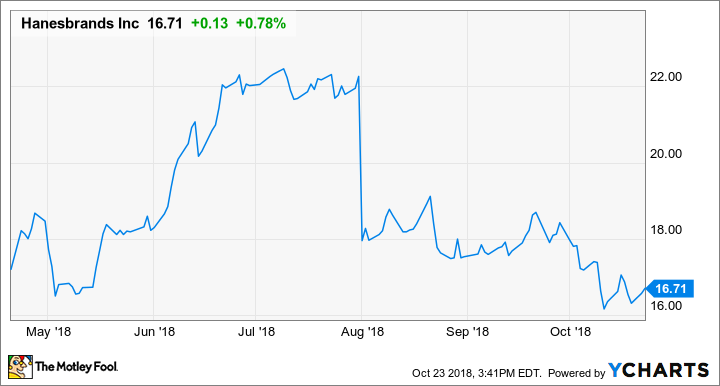 For starters, the C9 line generated $380 million in trailing-12-month (TTM) revenue, as discussed during the second-quarter conference call, which is just under 6% of the company's total TTM revenue. That revenue loss is nothing to sneeze at, but investors can be sure management is pressing hard to replace that revenue with another partner, contract, or organic growth, and the company has over a year to figure it out. Not only is Hanesbrands poised to rebound if it proves to investors it can replace its C9 Target sales, but that announcement also overshadowed its momentum globally and in its consumer-directed sales. For example, Hanesbrands international sales were a modest $0.5 billion in 2013, representing only 11% of total sales, and in 2017 international sales reached $2.1 billion and generated 32% of total sales, and that momentum is expected to continue. Global consumer-directed sales, which consist of company retail and online channel sales, jumped from $0.4 billion to $1.4 billion over the same 2013-2017 time frame, and from 9% of total sales up to 21%. There are also challenges facing Hanesbrands. If the company can make progress on operating margin and net debt, it'll give investors more reasons to buy, which could fuel a stock price rebound. More specifically, management needs to use its global supply chain and create acquisition synergies to help improve operating margin, and it needs to lower its net debt-to-EBITDA ratio from about 3.9 as of the second quarter to its target range of between 2 and 3 –- both aspects are being addressed over the next few quarters. Hanesbrands' stock has tumbled, but there are many catalysts that could reverse that trend, and investors willing to buy in will have a juicy 3.68% dividend yield paid out by this hated stock. 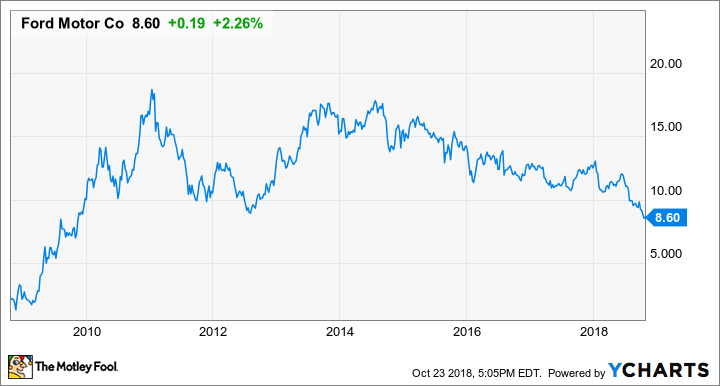 With its stock price sliding throughout 2018, Ford has pushed its price-to-earnings ratio down to an embarrassingly cheap 5, and simultaneously pushed its dividend yield up to a staggering 7.1%. To be fair, Ford does face a number of challenges and uncertainties. One challenge Ford is facing is a stalling U.S. new vehicle market. Ford's year-to-date sales are down 2.1% through September -- with a black eye in its car segment, which posted a steep 16.6% year-to-date decline. If you think those results are weak, just glance at Ford's sales in China, the world's largest automotive market. Ford's total sales were down 43% during September, and are down a significant 30% year to date through September. The good news is that Ford is unleashing a wave of new products, including the 2019 Ranger, to help replace 75% of its U.S. portfolio, and it has a similar strategy for China. Ford's 2019 Ranger is part of a two-year onslaught to refresh its product portfolio. Image source: Ford Motor Company. A rare bright spot for Ford in 2018 has been the success of the F-Series, its bread-and-butter full-size truck; few understand just how important the F-Series is to Ford's bottom line. September was the seventh straight month F-Series sales topped 70,000 units, a very strong performance. Not only are F-Series sales healthy, but average transaction prices are checking in at record levels of about $46,600 per truck -- that's $1,000 more than the prior year. The problem for Ford investors is simply that new products sell better, and General Motors' (NYSE:GM) next-generation Silverado and Sierra are rolling into dealerships right now. Truck customers are insanely loyal, but if Ford's crosstown rival steals some consumers, it could make 2019 a much rougher ride for Ford investors. Setting Ford's challenges aside for a moment, there's potential for the company's stock to rebound from these lows, and it revolves around driverless vehicles. So far GM has thoroughly outshone Ford, and just about all competitors, in the race to developing driverless vehicles, as well as preparation for the opportunity surrounding those vehicles. GM Cruise, the automaker's self-driving subsidiary, has plans to launch a self-driving taxi business in 2019, and some analysts predict it will be wildly profitable over the next decade. In fact, one analyst went as far to say that GM Cruise could be worth $43 billion, a staggering amount for a tech start-up GM acquired in 2016 for roughly $1 billion -- especially compared to GM's and Ford's respective market caps of $45 billion and $34 billion. Ford hasn't been sitting idly by, and is also working on driverless-vehicle technology. One example came in late July, when Ford announced it would invest $4 billion through 2023 and formed a subsidiary named Ford Autonomous Vehicles LLC. This subsidiary will have the tall task of fulfilling Ford's promise to launch a self-driving commercial vehicle at scale in 2021; management believes the automaker has already made tremendous progress in the self-driving value chain. Yes, Ford is definitely behind its crosstown rival in the race to developing driverless cars, and in finding unique ways to generate revenue from the businesses surrounding those vehicles. A lot of negativity is priced in, pushing Ford's stock under $9. But if it can create a big win with its self-driving subsidiary, as GM has, that could definitely fuel a rebound in Ford stock, as a wave of new Ford vehicles helps support sales over the next couple of years. Sure, some stocks are cheap for a reason. Hanesbrands must replace its C9 sales at Target, and Ford must accelerate its driverless-vehicle strategy. But both stocks have the potential to rebound from these lows -- and their dividend yields of 3.6% and 7.1%, respectively, aren't too shabby either.